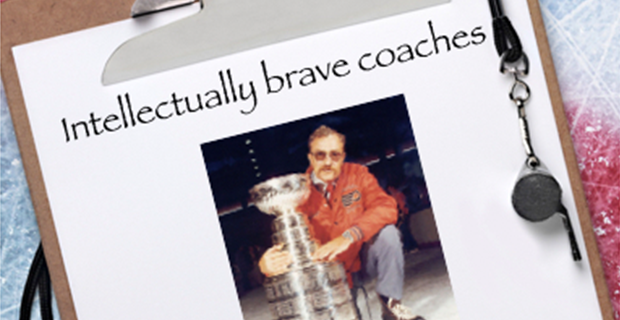 Is there such a thing as an intellectually brave minor hockey coach? If there is, how would we know we’ve found one? Most coaches of elite players I’ve known didn’t stand pat with their rosters. Given how much kids change from year to year in every imaginable way, it only made sense that to improve a team sometimes meant making changes. For instance, I knew a minor midget AAA coach who wasn’t afraid to look at the kids coming to him from major bantam and determine that a few couldn’t cut it at the next level. We could argue all day whether or not he was right. Like all coaches though, this was his call and he’d have to live with it. That, to me, is a small example of someone who is intellectually brave. Brave, however, is not synonymous with being correct. In fact, with the exception of extremes, coaching is anything but an exact science. So when a minor hockey coach takes a stand, there are inherent risks. Most recognize what they are, though not all think them through. If a coach cuts a board member’s child from a competitive team because the child wasn’t, at this time, good enough, is that being intellectually brave? Certainly the easier route would be to say the child is “a bubble player” and made it by the skin of his/her teeth. Does that assure the coach of support from the executive? Has the coach merely buckled to conform and take the road more travelled? Tryouts and sorting kids into levels is a path fraught with questions that test the bravest of coaches. But intellectually brave also refers to teaching methods and content. This is where the path gets fuzzy and often obliterated. Most coaches believe what they teach is acceptable even if they don’t know why. Example: we have to teach breakouts to these atoms. Well, yes, that’s sort of true, but how to do it knowing it may take months for them to grasp the nuances of breakouts in atom hockey and deal with the different kinds of resistance. Is this coach patient – alright, intellectually brave – enough to break down the tactic to its simplest elements then build on them over the season? Is it being intellectually brave to attempt to use small area games and related concepts to practice, tantamount to experimenting with the team? What about running practice activities that are essentially based in experiential learning? Is it important the kids be exposed to new ways of learning for just this one year knowing full well little of it – or none – may happen again? Is it brave to just roll the lines and defence pairs and alternate goalies no matter the results? These kinds of coaches are more the exception than the rule. That’s the kids’ loss.